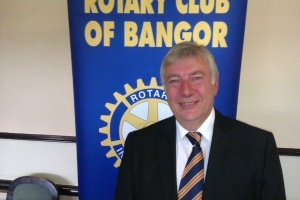 Ian Wilson, recently retired manager of the North Down Museum, sporting a fine tie and well scrubbed for the event, spoke to the Club on his 28 year career. Ian told us of the excitement of securing the VC won by Bangor-born Vice Admiral Billy Bingham for the Museum’s collection as well as the subsequent unsuccessful attempt to steal to the medal from its display case. Ian added a colourful account of his involvement with a time-capsule project, the development of the Museum during his time in office and the four occasions on which Bangor residents approached the Museum for information that would help them identify the personalities behind the ghosts that were resident in their homes..